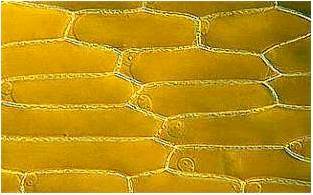 In plant cells, apart from the plasma membrane, there is a hard protective covering which is called the cell wall. Why do plants have cell wall? What would happen if we possess cell wall? The advantage of having a cell wall is, it is primarily made up of cellulose, a tough substance that provides great protection from external injuries. Like two sides of a coin, this protection is delivered at the expense of free movement. We can move in search of food as we don’t have cell wall. Plants cannot move and have to find their food from the rooted site itself. Definitely, their capability of photosynthesis clearly overcomes this disadvantage. In plant cells, cell wall is made up of cellulose, hemicelluloses, pectin and proteins. Remember fungal cell wall is made up of chitin (polymer of N-acetyl glucosamine) and bacterium has a peptidoglyacan cell wall. Cell wall is a stiff protective layer outside plasma membrane and provides mechanical support and also determines the shape of the cell. Plant cell wall, what is it made up of? Cell wall is composed of variety of polysaccharides. Cellulose microfibril is the basic building unit of primary wall surrounded by a matrix of hemicelluloses and pectins. Secondary wall consists of cellulose microfibrils surrounded by lignin. The orientation of microfibrils is governed by cytoskeleton. Cellulose is a linear, unbranched polymer, consisting of straight polysaccharide chains made of glucose units linked by 1-4 β glycosidic bond. Each microfibril is a ribbon like flat fibre of 25-30 nm in diameter. Each microfibril cosists of three elementary fibrils (micelles). Each elementary fibril is made up of 100 cellulose units. Each cellulose molecule consists of 40-70 glucan chains. Thus 1 microfibril=3x100x70=~21000 glucan chains. Microfibrils have great tensile strength similar to that of rubber. Are short branched heteropolymers made up of various kinds of monosaccharides like xylose, mannose, glucose etc. A water soluble branched polysaccharide made up of negatively charged D-galacturonic acid and D-glucoronic acid residues. Other depositions include cutin (made of fatty acids), Suberin (water resistant coat comprising of fatty acids found in many plant cell walls and cork. Mineral deposits are present in the cell wall of families Cruciferae and Cucurbitaceae (Calcium deposits), whereas silicate deposits are common in the cell wall of Graminae, grass family. Primary cell wall is the first formed boundary of the cell that is formed when cell is increasing in size. It is thin and permeable but cutin deposition makes it impermeable at some sites. Cellulose is synthesised from uridine diphosphoglucose (UDP-glucose) by an enzyme complex, cellulose synthase. Matrix materials, hemicelluloses and pectin are synthesised in the golgi apparatus and transported to the plasma membranes as vesicles where it is discharged and deposited. Why wood is so hard? Secondary wall is thick and permeable and consists of cellulose microfibrils and lignin. Even the master digesters, fungus cannot degrade lignin that offers mechanical protection from fungal pathogens. Lignin deposition is very common in wood. The formation of the secondary wall is not uniform in all the cells. The differentiation of various types off cells like parenchyma, collenchyma, sclerenchyma, fibres and tracheids are due to the secondary wall formation. Tertiary wall: In some tissues a tertiary cell wall is formed on the inner surface of the seconary cell wall. This layer is very thin and is found in the xylem tracheids of gymnosperms. It is composed of mainly of xylan, instead of cellulose. How adjacent cells are joined? Middle lamella: It is thin amorphous layer of cemeting material present between the adjacent cells. It is chiefly made up of calcium pectate. It is formed at the time of cytokinesis by the joint activity of the cells between it lies. Structure of lignocellulose:The main component of lignocellulose is cellulose, a beta(1–4)-linked chain of glucose molecules. Hydrogen bonds between different layers of the polysaccharides contribute to the resistance of crystalline cellulose to degradation. Hemicellulose, is composed of various 5- and 6-carbon sugars such as arabinose, galactose, glucose, mannose and xylose. Lignin is composed of three major phenolic components, namely p-coumaryl alcohol (H), coniferyl alcohol (G) and sinapyl alcohol (S). 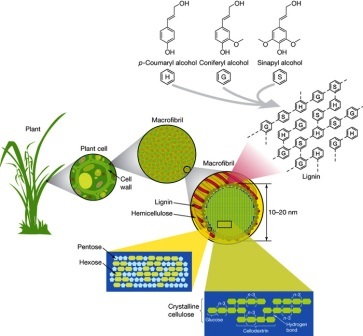 Lignin is synthesized by polymerization of these components and their ratio within the polymer varies between different plants, wood tissues and cell wall layers. 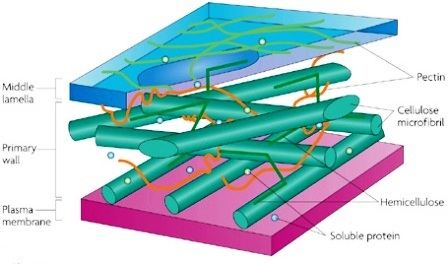 Cellulose, hemicellulose and lignin form structures called microfibrils, which are organized into macrofibrils that mediate structural stability in the plant cell wall. Cell walls primary function is mechanical support. It acts like a skeletal framework of the plants. Cell wall is tough and has high tensile strength. Still plant cell is fully permeable to water and solutes. Plant cell wall has minute water filled channels through which water,hormones and gases passes to and fro. Cell wall shows plasticity and elasticity during cell growth. Lignification of secondary walls greatly enhances compressive strength permitting woody structures to reach the sky. Cell wall upon lignification becomes dead as it becomes impermeable and thus protoplasm has no access to take up solutes that is why lignified tissue is always dead. Lignin provided extra mechanical strength and also provides a water resistant channel for transport of solutes. Algal cell wall: Algae typically possess walls constructed of glycoproteins and polysaccharides, however certain algal species may have a cell wall composed of silicic acid. Alginic acid is common polysaccharide in the cell walls of brown algae. Manosyl form microfibrils in the cell walls of a number of marine green algae, such as Acetabularia as well as as in the walls of the some red algae, like Bangia and Porphyra. Sulphonated polysaccharides occur in the cell walls of most algae, those common in red algae include agarose, carrageenan, porphyran, furcelleran and funoran. The group of algae known as the diatoms synthesise their cell walls from silicic acid (specially orthosilicic acid, H2SiO4).